I love the photos that the MTQ puts online for its projects. It makes the 185 project look awesome. I wish MTO put pictures like that online of its projects. Here are my photos from earlier this month of the two new A-85 segments. 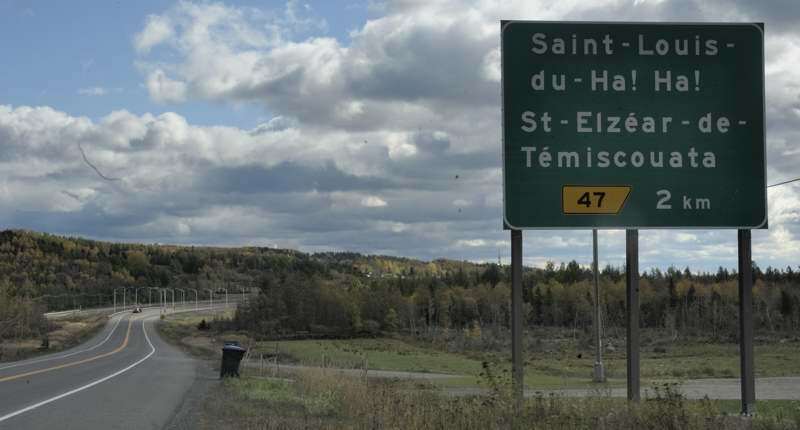 One segment is from the NB/QC border to north of Degelis, and the other is from south of exit 29 near Notre-Dame-du-Lac to north of exit 47 in St-Louis-du-Ha! Ha! I also took some photos of the construction between the two segments, which is planned to fill the gap between the two new segments by December 2015. 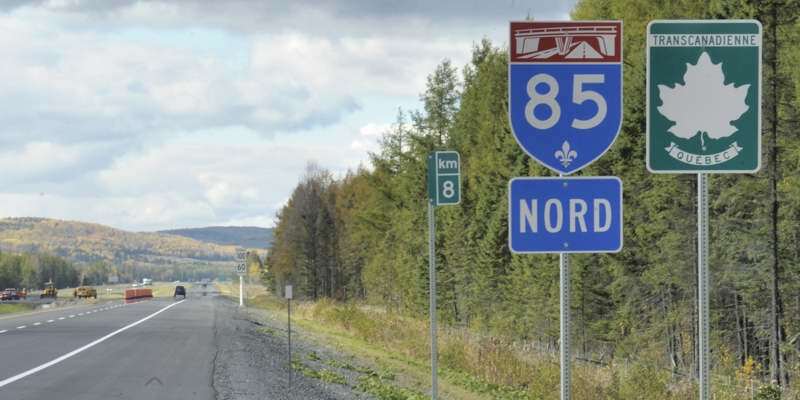 (No work underway to extend A-85 north of St-Louis-du-Ha! Ha!, to fill in the remaining gap with the Riviere-du-Loup segment.) The photos are roughly in km-marker order, which starts at the NB/QC border since A-85 is signed as a north-south route even though its actual direction is more west-east. ^ A-85 and TCH markers northbound, at km 8. This isn't the first set of markers entering from New Brunswick, but it is conveniently right next to a km-marker which confirms the location. ^ This sign is on Traverse Johnny-Griffin eastbound, at the exit 7 underpass. The road connects A-85 to the old TCH route, now called Av. de la Madawaska southeast of Degelis. The Johnny-Griffin/Madawaska intersection is about at the point where the old route is closest to the new route; there are much wider gaps between the old and new routes both north and south of this intersection. Traverse Johnny-Griffin also connects A-85 to the Av. du Longeron frontage road along the southbound lanes, which continues north to exits 12 and 14. 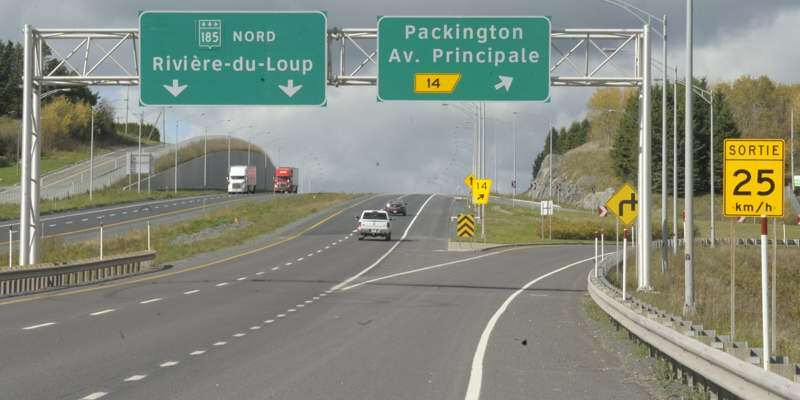 ^ This photo, showing A-85 signage southbound on the overhead sign, was taken at exit 12 for Rue Industrielle and the Av. du Longeron frontage road. Edmundston would've been a logical control city (it's used elsewhere on A-85), but the "control province" was used here instead. Exit 12, and exits 1 (northbound-only, just north of the NB/QC border) and 7, are on the new A-85 roadway south of Degelis, which ties into the old route near exit 14 for QC 295. 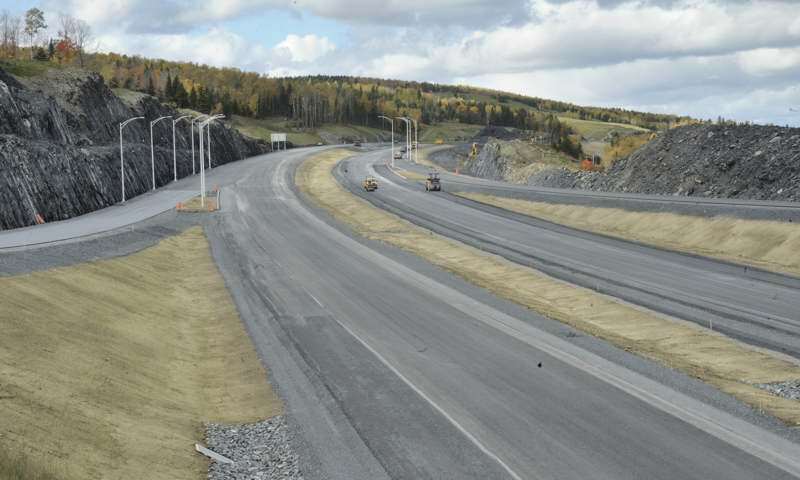 The short new roadway on the New Brunswick side of the border, to tie in the new A-85 segment with NB's part of the TCH, also has a new southbound-only exit 1, to match up with the new northbound-only exit 1 on the Quebec side. This oddity, somewhat like the exit 2s on each side of the new US 93 bridge between Nevada and Arizona, is from Quebec treating A-85 and the rest of the TCH south of A-20 as a north-south route, while New Brunswick treats TCH 2 as a west-east route. One could also treat the closely spaced exit 1s as part of a single interchange, ignoring the provincial border running through it. ^ Heading back northbound is this curious set of signs north of the QC 295 overpass at the RIRO for Av. Principale into downtown Degelis. The last time the GMSV camera car drove through (the highway then was freeway at this location, before the new A-85 roadway was opened southeast of Degelis), the RIRO used to be signed as exit 15. But while its new exit number is now shared with exit 14 southbound for QC 295, there's no mention of QC 295 here (you can get to QC 295 from here, but only via a tedious slog through downtown Degelis). Also new to this sign assembly is the overhead sign showing the control city of Riviere-du-Loup added a route marker, but for QC 185 rather than A-85. There is a freestanding A-85 route marker north of this interchange, and the twinned limited-access highway continues to near km 19 (no additional exits yet north of exit 14), but this new signage leaves unclear for now whether the highway north of Degelis is part of A-85. 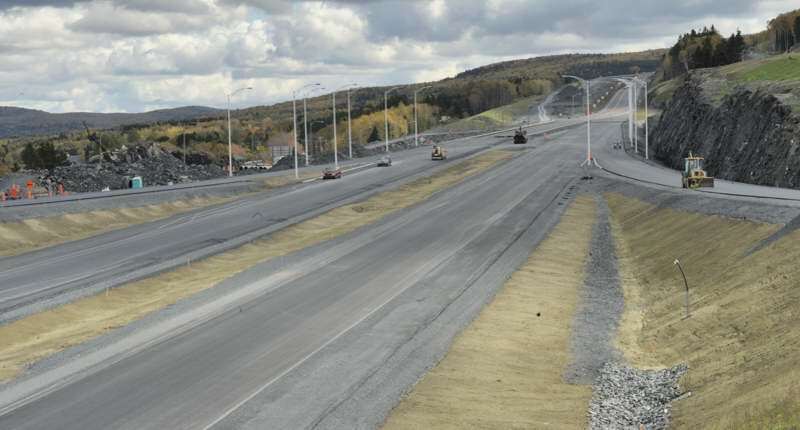 Around km 19, the highway turns into a two-lane roadway with twinning construction underway until near km 24, and if there was route signage between km 19 and exit 29, it was only as QC 185. From near km 24 to just south of exit 29, the construction shifts to a new-alignment route very close to and southwest of the existing route. ^ These three construction zone photos are from the Rte. St-Benoit overpass, reached by a turnoff from the old route still in service near km 24.6. The first two photos are views of the new alignment southbound, with the second a closeup focusing on the tie-in area between the new and old alignments near km 24. The third photo is of the new alignment northbound. The construction includes a new interchange with Rte. St-Benoit, though I don't know what will be the new exit number. ^ This is the first exit sign for the new A-85 segments southbound, approaching exit 47 for St-Louis-du-Ha! Ha!, before twinning starts just north of that exit. I pulled off the new freeway here hoping to score some postcards to send my nieces from there. Alas, it's a fairly small town with no visitor centre or other effort to exploit its funny name. It turned out to be another one of those towns not nearly as interesting as its name. There is an A-85 route marker northbound just north of exit 47 (the first corresponding southbound A-85 marker is near km 47.3, just south of exit 47). However, almost immediately thereafter the highway changes from four-lane divided controlled-access, to two lanes undivided with at-grade intersections. The first such intersection north of exit 47, at Ch. de la Savane (not counting the driveway shown in the above photo), has signage indicating that the highway remains QC 185 in both directions. ^ Heading back northbound is this curious set of signs north of the QC 295 overpass at the RIRO for Av. Principale into downtown Packington. This is downtown Dégelis. MTQ often mixes town X and streets from town Y on the same sign, especially after signign "TOWN Y 2 NEXT EXITS". That can be confusing, I admit. Thanks. Both references to Packington in my post above have been corrected accordingly. Interesting. Any pictures? I remember seeing the sign plans and they pretty much called for proper NB-style and QC-style signage depending on where the signs were installed (although all of them were to be made by Québec). The local busline, Maritime Bus, recently went back to the future for the bus stop in Degelis, leaving Motel Claude to return to Motel Le 1212, the stop during the Voyageur bus days. So what actually is going on with Phase 3, will the endless headache of the political stalemate ever be resolved? I mean really, how long has this been going on for now? If by "Phase 3" you mean the big gap from Saint-Antonin to Saint-Louis-du-Ha-Ha, no ground had been broken on anything there when I passed through last October. As far as I am aware none will be anytime soon since a shift in Quebec's government resulted in all new autoroute construction that wasn't already underway being put on indefinite hold. What I'm particularly interested in is whether the gap between the Degelis (NB border-exit 14) and Notre-Dame-du-Lac (exits 29-47) will be sufficiently filled soon, by rerouting two-way traffic onto one side of the new A-85 roadway between those segments from the old QC 185 roadway. Local press reports (in French, so I hope the auto-translation is right) indicate that might happen next week. If so, I can update the Travel Mapping database with one new A-85 eastern segment (plus related TCH reroutings) right away, rather than add separate Degelis and Notre-Dame-du-Lac segments now, then go back and merge them in a few months when construction is completed. OpenStreetMap has A-85 in the gap, but it's jumped the gun before on other Quebec projects. Phase 2 has been completely open in 2015. 1 G$ funding for Phase 3 (final) has been announced in July. 400 M$ federal funding at stake right now with ongoing election. Just checking up on this project. Apparently, construction of the final stretch of Autoroute 85 will commence in 2017, for a completion date in 2021. 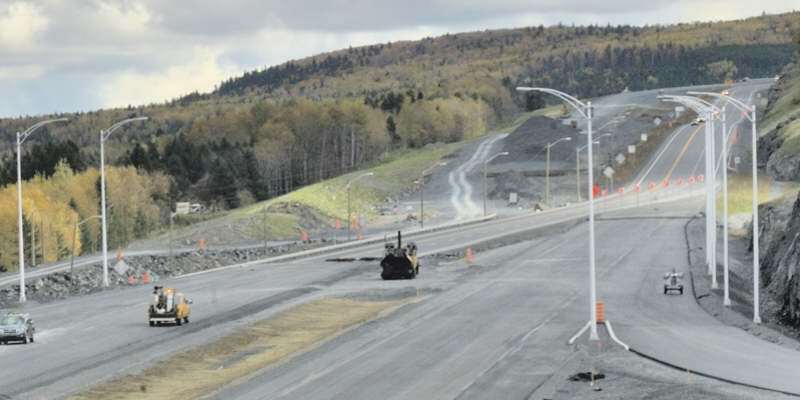 New vid of A-85/QC-185 between Riviere-du-Loup to Edmonston! Not sure if this is new, but apparently, it won't be done until 2025. I find it odd that A-85 is considered a north-south route when it runs more east-west. I see where you're coming from, but I think it's due to being perpendicular with A-20, which is an E-W route. Also, how would it fit in the grid as an E-W route? It would be south of A-20, but it's also pretty far north to have a number less than 20. I think numbering it 85 is the simplest solution. And besides, I-85 runs in an E-W fashion, despite being signed N-S, so clearly, this is not unique to the Interstate grid. Quebec autoroute numbering makes sense if you 'skew' the directions such that the St. Lawrence River is "east-west". It makes even more sense if you consider the historic pattern of settlement of French river lots where land was divided perpendicularly to a large river to provide access to it for a maximum number of landowners. Look at property maps/plats in France, Louisiana, Green Bay Wisconsin, or the St Lawrence Valley. As odd as it can be, from A-20, A-85 is marked North-South, and continues in New Brunswick as NB-2, marked East-West! It's true that the MTQ cheats a bit with directions; they consider St. Lawrence river as East-West axis, so at least in St. Lawrence valley, they mark roads accordingly. But go figure, they also consider Saguenay river East-West, even if it's almost the same axis as A-85! Ugh! I was expecting an update.